Media captionDiscovering the rivers under Sheffield city centre. Underground tunnels that carry rivers beneath the streets of Sheffield are being opened for public exploration. The city developed at the confluence of the River Sheaf and River Don but the Sheaf has been hidden underground since the mid-19th Century. The waterway that gave Sheffield its name is directed through culverts under the railway station and city centre. A complex of Victorian tunnels includes a large, brick-vaulted "cathedral" often called the Megatron. The culverts carrying the Sheaf and Porter Brook through the city are usually only accessed by urban explorers in illicit trips. 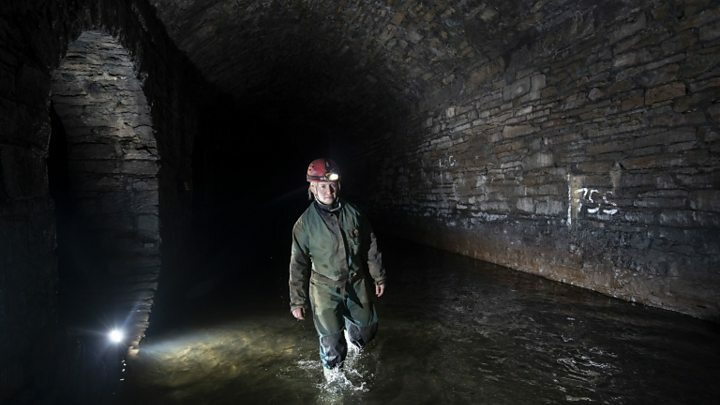 Now the urban caving is being led as part of the Sheffield Adventure Film Festival and a pop-up screen is to be used for an underground audio-visual experience, organisers said. Mat Heason, from the festival said of the tunnels: "It's beautiful. It's amazingly built, these Victorian engineers knew what they were doing, they were the rocket scientists of their day." QUIZ: What do you know about Pancake Day? The Castlegate area, where the River Sheaf flows out of the darkness and into the River Don, is home to a redevelopment project that includes a bid to excavate the remains of Sheffield Castle. The city council is hoping to open up the last few hundred yards of the River Sheaf from the Megatron to the Don in a park to be called Sheaf Field. Simon Ogden, head of the Castlegate regeneration, said the Victorian culverts are reaching the end of their life and would soon need replacing. The Megatron "rises up it like a cathedral" and he wanted to rescue part of the rivers from "underground obscurity", he said.